Parfait pour une escapade pour profiter des couchers de soleil sur le lac chaque nuit. Serait parfait pour les snowbirds qui veulent faire du froid et de la neige dans le nord pendant l'hiver. Lac privé où la pêche est grande. Ceci est une zone boisée et la maison se trouve sur 1. 2 hectares. Canoe et pagaies sont sur place. Il ya aussi un bateau jon avec des rames. Vous pouvez également lancer votre propre bateau de la propriété. Rôti de guimauves sur un feu de camp et manger soit sur le quai ou la table de pique-nique. Profitez de la natation, la pêche et le canoë-kayak sur une belle privée, lac, alimenté par une source. Disney World ou les attractions de la région d'Orlando sont à environ 2 heures de route. Busch Gardens et autres attractions de la région de Tampa Bay sont à environ 2 heures de route. Deux salles de bains ont des douches, une à l'étage supérieur et l'autre à l'étage inférieur. Thoroughly enjoyed our stay! Riley Lake house is very accommodating. Caught & released fish all week with 7 yr old grandson, took in the FL Museum of Natural History, local scenery and restaurants. Hope to come back again. Would recommend PJ's in Hawthorne and Outback Smokehouse in Interlachen. The food & ambiance at Outback Smokehouse is worth the drive. It was very peaceful and quiet. It was nice surroundings. We liked the house,it was everything the owner said it was. We would stay there again given the chance. We had an amazing time relaxing and enjoying the outdoors. In the process of relocating to Gainesville, we needed a rental for a few weeks. 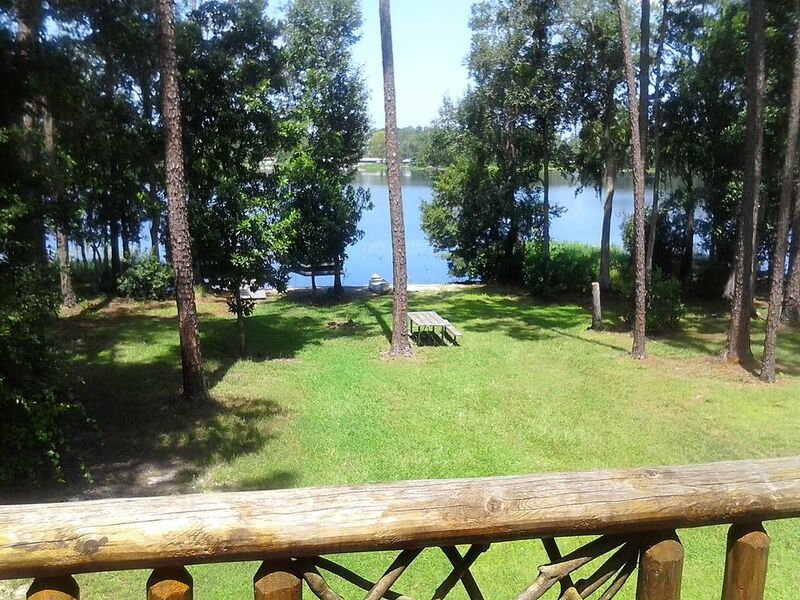 Since it was near Thanksgiving, we decided to look for a lake house near Gainesville. The lake house at Riley Lake was perfect for us. It allowed us a quiet place to unwind in the middle of a busy time, plus a place to have our family for Thanksgiving. The lake house had everything we needed, except for the turkey roasting pan, which the owner let us know ahead of time. (Smile) The kitchen was very well equipped, and the local grocery store was less than 10 minutes away. It also had a garage, which was a plus for us. We enjoyed rowing in the boat and fishing during the day, and fires and s’mores at night. We also played pinball, ping pong, tether ball, and also managed to play a game of Yahtzee. All of our guys, who love to fish, caught a bass, with the biggest one weighing in at around 6 lbs. The owner was very friendly, professional, and available. He also called to check on us once we had arrived and settled in. The place is absolutely gorgeous and the owner is exceedingly helpful and friendly. Was more then we hoped for! Pool perfect, hot tub was a blast. Walk to lake was very fun, looking at everything growing there. The lake was so incredible gorgeous and huge, wanted to jump right in. Place is very well equipped, and best of all very clean. Will go back, but next time will take our daughter because think she'll love it too. Recommend you go, you won't regret it!